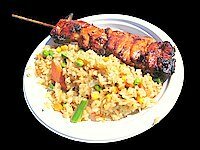 I'm loving cooking chicken with sweet chilli sauce and this Chicken On A Stick Recipe has a superb sweet chilli marinade. You can either buy the skinless, boneless chicken breasts ready prepared or just do them youself. Breast chicken recipes are wonderful because there are endless variations of what you can cook up. Of course its cheaper to debone and remove the skin from the chicken breasts yourself but then again time-saving to buy them prepared. Combine the ginger, garlic, olive oil, honey, sweet chilli and soy sauces together in a non-metallic bowl. Add the chicken cubes, mix well and allow to marinade for 1 - 2 hours in the refrigerator. Soak the wooden skewers in warm water for 15 minutes before use to prevent burning. Thread 4 or 5 cubes of chicken onto each wooden skewer. Grill over hot coals for 5 minutes on each side, or until cooked through, basting with the remaining sauce during cooking. There's a variety of side dishes to go with chicken kebabs. If it's a summer barbeque you're having then green salad is lovely. Roasted vegetables are also very nice. You might love to receive our personal newsletter called Cooked Up. It's packed with great recipes, cooking tips and other interesting news. I invite you to safely subscribe in the form below..... Oh and of course it's free! I promise to use it only to send you Cooked Up. Looking for ideas for dinner? Cook better, look better and feel better with recipes that are tempting to serve and taste great! Give up nothing except fat and calories. Get fitness ideas that are fun and easy. Looking for KFC's Fried Chicken Recipe? Get inside the hidden cookbooks of America's favorite restaurants. The secret recipes for over 100 all-time favorite dishes have now been revealed in this best-selling new cookbook. Prepare dishes you know they'll love and save money by easily making them at home. 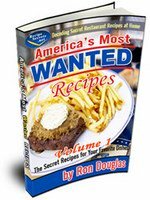 Get free sample recipes just for visiting the site. If you can't find what your're looking for, you might want to try our easy-to-use Chicken Recipe Search Box. You can also use it to find anything else you might want to search for on the wider web. Work-At-Home-Moms click here! Chicken-Recipes-Made-Easy.com © Copyrite 2012. All rights reserved.